The Center IC is a customer relationship management system that brings the power of the Internet to your directors, management consultants and administrative staff. Center IC provides fast access to your client and event database with intelligent system design. 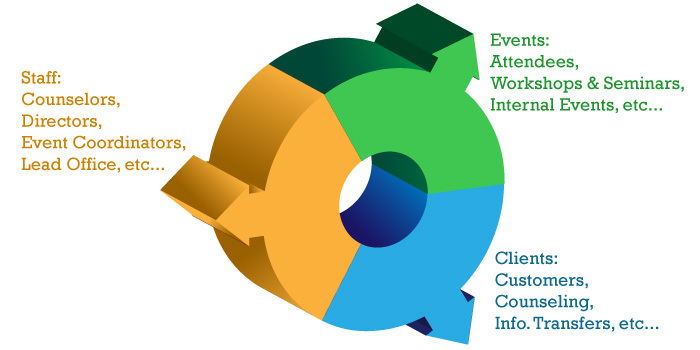 Center IC allows users to manage clients and counseling sessions, training events and attendees, event participation, customer appointments, mailing lists, and impact & performance metrics in an easy-to-use web interface. Center IC is staff-friendly. It has an intuitive tabbed interface that focuses on making a counselor's work easier. At every turn, the Center IC helps counselors and staff to manage their client portfolio with customer follow-up lists one click away. Adding new customers is streamlined and prevents duplicates with powerful wizards to make the job easy. Center IC features a sophisticated web-based reports engine that allows users to create template reports that may be scheduled to run. These scheduled reports will automatically run and e-mail themselves to pre-selected recipients. For example, you may choose to schedule monthly reports that would be delivered to you via e-mail on the first Monday of every month with the report featuring data from the previous month. Additionally, you always have the option to run any report at any time. The variety of reports in combination with IC's report filters and groupings combine with the overall system interface to provide a shophisticated report capability. From client impact to counselor goals to center performance, IC delivers myriad report capabilities. Center IC ensures records meet SBA requirements but also surpasses those requirements. It allows business development programs to leverage with local partners and capture coordinated efforts in meaningful and separable metrics. Center IC is a powerful tool for capturing economic impact including jobs created, capital formation, sales growth, minority certifications and more. Center IC is also compatible with the SBA's EDMIS management system, and hides the complexities of EDMIS as much as possible from staff. It features a live 'EDMIS Preview' that lets you see what SBA will see (using their own formulas), before you export. It also has a daily issue review to help catch problems before the end of the quarter rush. Center IC is staff-friendly. It has an intuitive tabbed interface that focuses on making a counselor's work easier. Quote from a new Center IC user: "I am really excited about the new system. Center IC is really user friendly and much easier to navigate than [our previous system]."